It’s the middle of summer, and we’re all sweltering through the hottest days of the year (well, actually, it’s in the low 60s here in L.A., but roll with us on this). No one wants to go in the kitchen, let alone stay in the kitchen long enough to bake a chicken pot pie or slow-cook a vegetable soup. 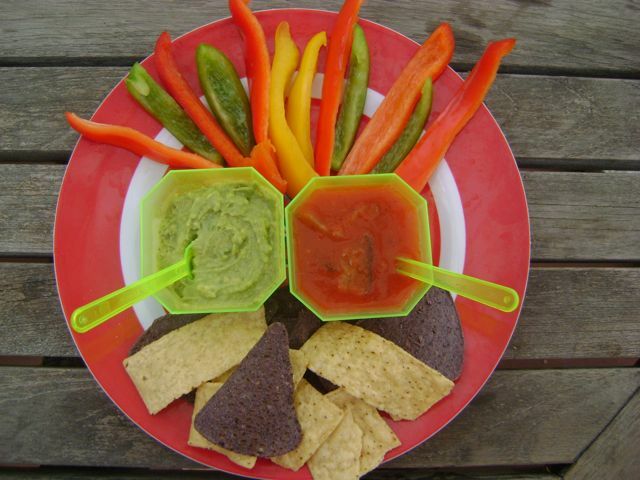 On the hottest days of the year, our kids get excited to help make (and eat) dinner when dinner is a no-cook snack. Of course we’re not talking about Teddy Grahams or vegan strawberry chocolate chip dino bites. We’re talking good-for-you stuff, which when served in small cold portions makes a pretty nice dinner. Exhibit A: Our favorite hummus snack plate. 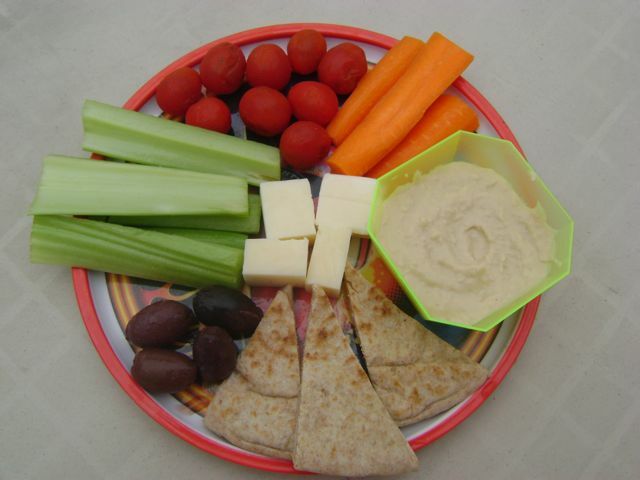 Arrange a plate with carrot sticks, celery sticks, cherry tomatoes, olives, a few chunks of cheese, triangles of pita bread, and a small bowl of hummus for dipping. If your kids turn up their nose at hummus, try making your own Ranch dressing or even Green Goddess dressing (our personal summer favorite) for the dip. Another variation is our Mexican Wacky Face plate. We serve little bowls of guacamole and gazpacho along with two kinds of tortilla chips, and an array of red, green, and yellow pepper strips. For protein, we usually add strips of grilled chicken or cold black beans or kidney beans for munching. Side note: We save the cups and tiny spoons from when we go out to eat gelato, so we’ve got a collection of teeny-tiny serveware for occasions like this. Our third favorite is an antipasto snack plate. 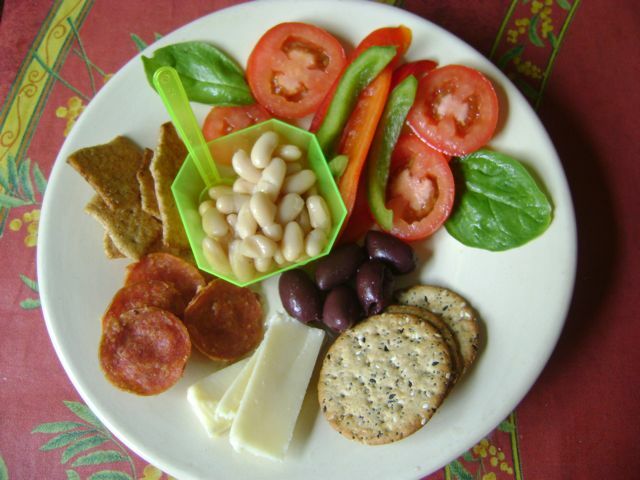 For this one we served up salami, olives, slices of fresh mozzarella, red and green pepper strips, whole-grain crackers, a few basil leaves, and a white bean salad. If we have it on hand, we like to use crusty Italian bread cut into chunks instead of the crackers (and the kids love to dip it in a teeny bowl of extra-virgin olive oil). Of course you can follow up each of these yummy snack meals with a serving of the summer’s best fresh fruit: blueberries, watermelon, peaches, strawberries, and so forth. Some people will tell you to bake a fruit cobbler or something, but we say, why turn on the oven at all? Fun Food Saturday: Because food should be fun (and not hot).